The promoters of this trust are all from middle class with limited resources. Since beginning, we are running the school purely based on nominal fees charged to some students (most of them are either exempted or subsidized from fee payment) and from meager donations (in terms of reading & writing books) received from good willing donors, and internal resources. 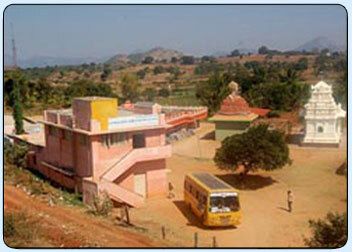 We have utilized temple buildings for school premises purpose. Owing to our counseling program and success we attained in our program, the demand for schooling is constantly increasing from villagers and hence the prime challenge is to enhance the basic infrastructure. The major project in our Education program is to build the facilities and infrastructure to include Science labs, library, auditorium and sports facilities etc to rural children with an independent school building.